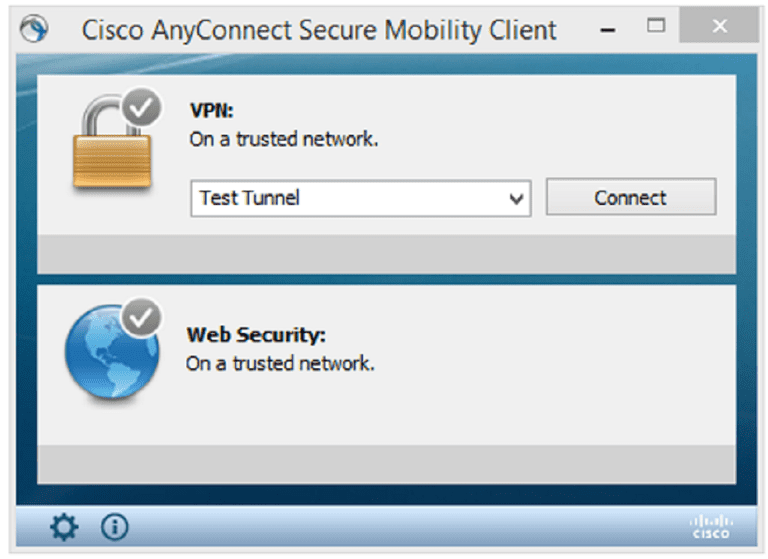 Cisco AnyConnect Security Mobility Client is the name of a security application from Cisco Systems that features Virtual Private Network (VPN) client support. This application replaces the obsolete Cisco VPN Client. Cisco AnyConnect should not be confused with the AnyConnect console shell application. A VPN client enables remote network access. The additional security protections that VPN connections offer are particularly useful when tunneling into private business networks from internet hotspots and other public networks. Cisco also supports mobile app versions of the software named Cisco AnyConnect Security Mobility Client for Mobile Platforms. These free client apps can be downloaded from the Apple App Store, Google Play, and Amazon’s Appstore. To use Cisco AnyConnect, users must install the software application and configure a profile for each server connection. The profiles require server-side VPN support—an addressable Cisco network appliance or other gateway device configured with the necessary VPN capabilities and AnyConnect licensing—in order to work. Businesses and universities typically bundle preconfigured profiles as part of their customized software installation packages. Launching the VPN client after it is installed brings up a window with a selectable list of installed profiles. Choosing one from the list and the Connect button initiates a new VPN session. The application prompts for a username and password to complete authentication. Similarly, choosing Disconnect terminates the active session. While older versions only supported SSL, AnyConnect VPN currently supports both SSL and IPsec (with appropriate Cisco licensing).